James Paley and Mary Ann Paley (nee Spink) are my 2x great grandparents. They’ve only had very brief mentions in my blog up until now. So having recently found their gravestone at St Peter’s church in Rylstone, North Yorkshire it’s time to write about them. James was born c1828 to parents William Paley and Mary Blackey. He was baptised on 23 March 1828 at Linton in Craven, Yorkshire. Mary Ann was born 20 June 1832 to parents John Spink and Sophia Shuttleworth Kitching. She was baptised 4 days later at Conistone, Yorkshire. I have Mary Ann in the 1841 census at home and in 1851 living and working in Keighley, West Yorkshire as a “servant”. And that is where I thought I was going to move on and tell you about James and Mary Ann after they married. However, sometimes when you look at the records afresh you spot things you might have previously missed. Searching the “Spink” baptisms in Conistone for this blog post I noticed one for Annie Elizabeth Spink on 18 June 1852. The baptism record shows the mother as Mary Anne Spink (spinster). Could it be that my Mary Ann became pregnant while living in Keighley and returned home to have her baby? Looking again at the 1861 census for John and Sophia Spink (Mary Ann’s parents) there is Ann Elizabeth Spink listed as “granddaughter”. I’m sure that I would have spotted that before but for some reason didn’t try to find out who the parents were – well now I know!! More research required about Annie Elizabeth I think. Ok – back to James and Mary Ann. They married on 11 April 1857 at Conistone. I have James and Mary Ann on all the census returns from 1861 to 1901. James is variously described as a farmer, road contractor or general labourer. For all of their married life they lived in the village of Hetton in the Yorkshire Dales. James died of bronchitis on 16 April 1903 – five days after their 47th wedding anniversary. He was 75 years of age. Mary Ann lived for a further four months and died of angina on 18 August 1903 at the age of 71. In her will she left effects valued at £451 6s 2d to her son James. This headstone is in the graveyard at St. Michael and All Angels Church at Linton in the Yorkshire Dales. I took this photograph about three weeks ago. 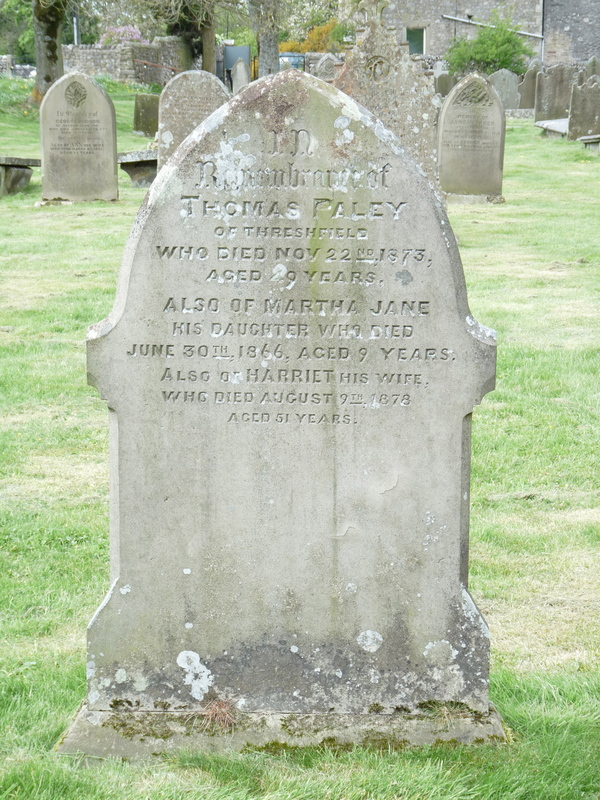 Buried here is Thomas Paley, his wife Harriet and their daughter Martha Jane. Thomas is my 2nd great grand uncle. He was born sometime in 1825 to William Paley (1797-1882) and Mary Blackey (1794-1877) and was the first of five children. On both the 1841 and 1851 census returns Thomas is living at home with his parents and siblings. In 1851 his occupation is described as a collier. His father and brother Francis were also working as colliers – presumably in the coal mines on Threshfield Moor. In Q1 of 1853 Thomas married Harriet Richmond. I haven’t researched Harriet’s family so have no information about her parents. I know that the census returns show her as having been born in Ripon, North Yorkshire. In the census returns for 1861 and for 1871 Thomas is described as a coal miner. So it appears he stuck to that dangerous occupation all his working life. Thomas died at the fairly young age of 49 on 22 November 1873. Unfortunately Harriet only lived for a further five years and died at the age of 51 on 9 August 1878. Their daughter Martha Jane had died on 30 June 1866 aged just 9 years. 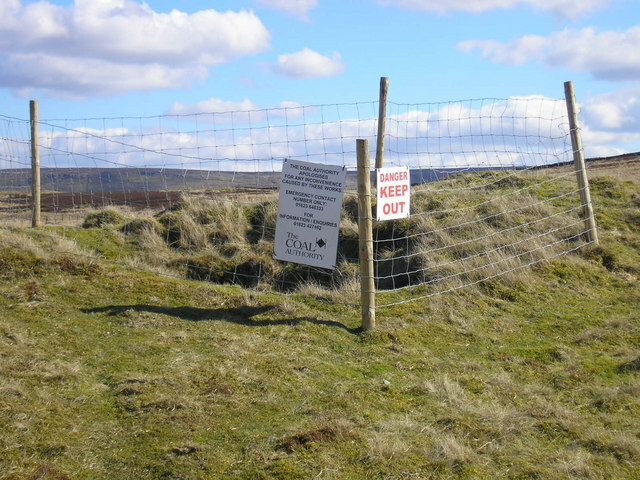 I was surprised to discover that coal mining took place in the green pastures of the Threshfield Moor and the Yorkshire Dales. In fact coal was mined on Threshfield Moor as long ago as the early 17th century. A document dated June 1607 records Lancelot Johnson sinking a coal pit at Threshfield. From the mid-19th century the colliery had a succession of owners. The last, John Delaney, built a washery at the pithead in an attempt to improve the quality of the coal. His aim was to produce coal to burn in his new lime works in Threshfield. The mine worked an area full of old workings and in the end the miners simply ran out of coal. The colliery was abandoned in 1905, although Delaney’s company continued to run Threshfield Lime Works until well into the 20th century.